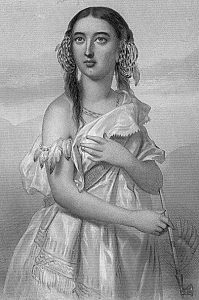 Most people are familiar with the story of Pocahontas – the Native American princess who fell in love with Englishman John Smith during the height of conflict between the English settlers and the indigenous people of the Americas. In 1995, Disney released an artistically beautiful animated film showing the supposed events that unfolded between John Smith and Pocahontas. Although Disney is known for creating fictional tales, many people believed that Disney’s account of the life of Pocahontas was a true reflection of past events: the love between Pocahontas and John Smith, the bravery Pocahontas showed when saving John Smith’s life, and the tragic ending when John Smith returned to England for medical treatment. However, this depiction is a far departure from the actual events that occurred, and from the real life of Pocahontas. During Matoaka’s childhood, the English had arrived in the ‘New World’ and clashes between the colonizers and the Native Americans were commonplace. In 1607, John Smith, an Admiral of New England and an English soldier and explorer, arrived in Virginia by ship, with a group of about 100 other settlers. One day, while exploring the Chickahominy River, John Smith was captured by one of Powhatan’s hunting parties. He was brought to Powhatan’s home at Werowocomoco. The accounts of what happened next vary from source to source. In John Smith’s original writing, he told of having a large feast, after which he sat and spoke with Chief Powhatan. 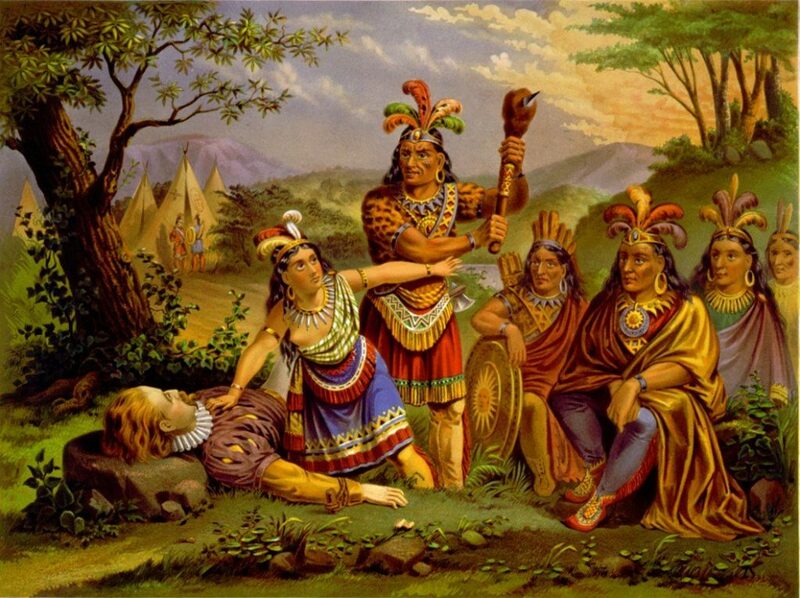 In a letter written to Queen Anne, John Smith told the story of Matoaka throwing herself across his body to protect him from execution at the hands of Powhatan. It is believed that John Smith was a pretentious man who told this lie to gain notoriety. In the Disney version, Matoaka/Pocahontas is depicted as a young woman when she saved John Smith, but by his accounts, she was only a 10-year-old child when these events occurred, and therefore highly unlikely that there was any romance between them. Matoaka often visited the settlement at Jamestown to help the settlers during times when food was in short supply. On 13th April, 1613 AD, during one of these visits, Samuel Argall captured Matoaka to ransom her for some English prisoners held by her father. She was held hostage at Jamestown for over a year. During her captivity, tobacco planter John Rolfe took a ‘special interest’ in the attractive young prisoner, and he eventually conditioned her release upon her agreeing to marry him. 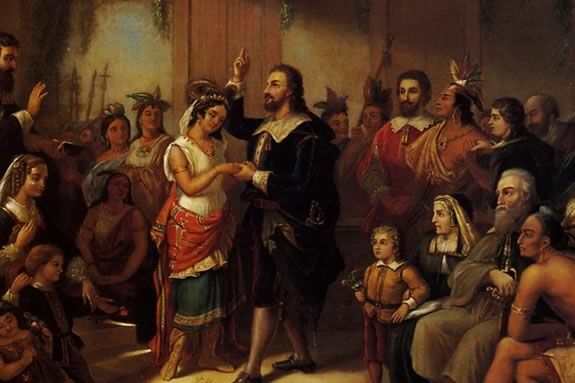 Matoaka was baptized ‘Rebecca’ and in 1614, she was married John Rolfe – the first recorded marriage between a European and a Native American. 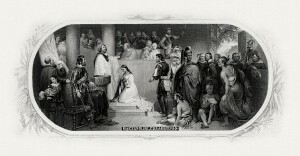 The Baptism of Pocahontas by John Gadsby Chapman (Wikimedia). Chapman depicts Pocahontas wearing white, being baptized Rebecca by Anglican minister Alexander Whiteaker in Jamestown, Virginia. She kneels, surrounded by family members and colonists. Her brother Nantequaus turns away from the ceremony. The scene symbolizes the belief at the time that Native Americans should accept Christianity and other European ways. Marriage of Matoaka to John Rolfe. From ‘Pocahontas: Her Life and Legend’ by William M. S. Rasmussen. (Wikimedia). the Native Americans. ‘Rebecca’ was seen an example of a civilized ‘savage’ and Rolfe was praised for his accomplishment in bringing Christianity to the ‘heathen tribes’.